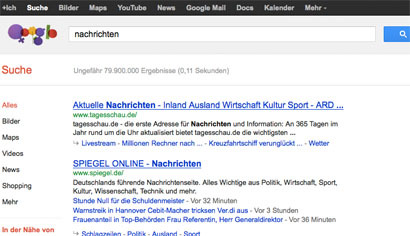 Germany’s governing centre-right coalition has proposed a new copyright law which would see content aggregators such as Google News paying royalties every time they index search results from news websites. Commercial traders out there, such as search engines and news aggregators, should pay a fee to the publishers in the future for the distribution of press products (such as newspaper articles) on the internet. Citing the German government’s original agreement, which states that online publishers “are not meant to be worse off” than other industries, the legislators suggest that the fee period should last for one year. The fee proposals do not cover individuals using the material for private purposes and private users “will not be affected” by the proposal to charge for access. Google has previously been sued for copyright infringement by French publishing houses Albin Michel, Flammarion and Gallimard, after the search giant scanned nearly 10,000 books for its Google Books site without permission. The publishers later dropped their case against Google, saying they wanted to seek an “amicable solution to the litigation”. In a similar copyright dispute in the UK, the Court of Appeal rejected arguments from the Public Relationships Consultants Association and news clippings service Meltwater that exemptions to copyright law could be applied to the content of newspaper websites, according to law firm Pinsent Masons. In the UK, users of a clipping service must now have a licence from publishers to click on links taking them to a news website to avoid infringing the publishers’ copyrights, says Pinsent Masons. This entry was posted in Journalism, Legal, Online Journalism and tagged Copyright, Germany, Google News, Pinsent Masons, sued on March 8, 2012 by Gaz Corfield.